The paint is dry, the light fixture is in place and the only thing remaining is to add the crown molding and hang my decor. I'm going to go ahead and show you the semi-after photos anyway because I just love the Peppercorn color and am so excited that this bathroom is 99.9% finished. The crown molding will go up this weekend, the wall decor will be added and we will be calling this room complete! Just to recap, this is where we started...boring, boring, boring. No pizzazz, poor lighting and no personality! Add a new vanity, some chair rail molding, a new light fixture, some light paint, a little dark paint...and you have a totally different room! It really took no time to add the darker color. 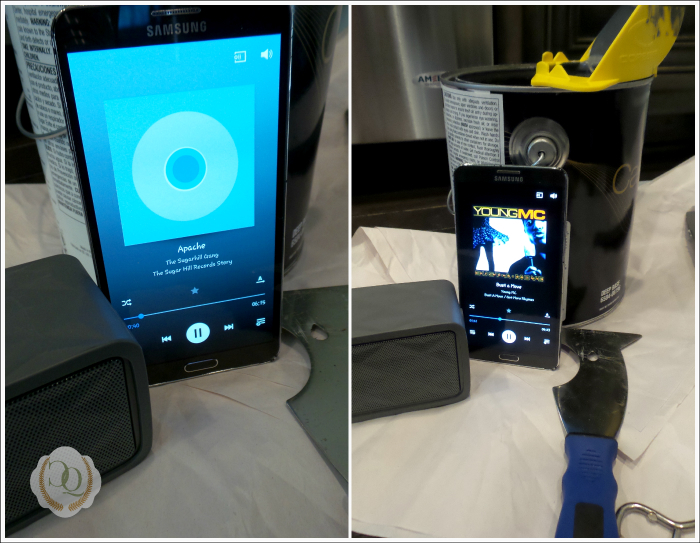 I just queued up some motivating tunes and got to work. Nothing like "Apache" by the Sugarhill Gang and "Bust A Move" by Young MC to get in the painting groove! I did have to be careful to not sling paint everywhere while I was "busting a move" and shooting those arrows. I will show some additional pics after the molding and decor! LOVING that Peppercorn paint...off to see what else might look good in this color! WOWZERS!!!!! What a difference! Can't wait to see it all dressed up!! Thank you so much! 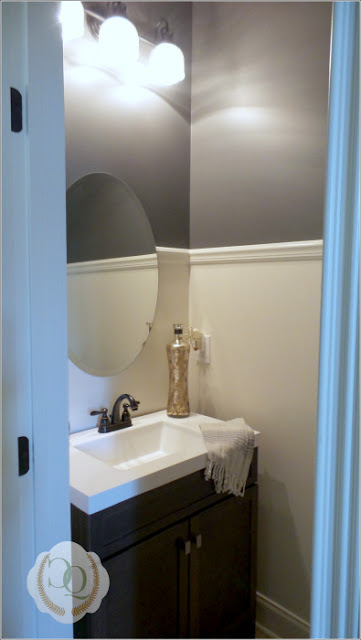 The paint did make a huge difference in this little bathroom! We love it!! Hugs! Thank you so much Julie! This color made such a huge difference in this small bathroom and it even feels different. EXACTLY...music motivates...LOL Hugs!! Your little bathroom looks amazing! Does the Peppercorn make the room dark? I love the richness of it with the beadboard. Thank you so much Stacey! Actually, it doesn't. Since the bottom part is the light color, it didn't make it seem darker at all. We love this color and I want to use it in other parts of the house. Thank you again so much! Hugs!! darker colors like that can make a tiny room look like a little jewel box. Thank you so much! 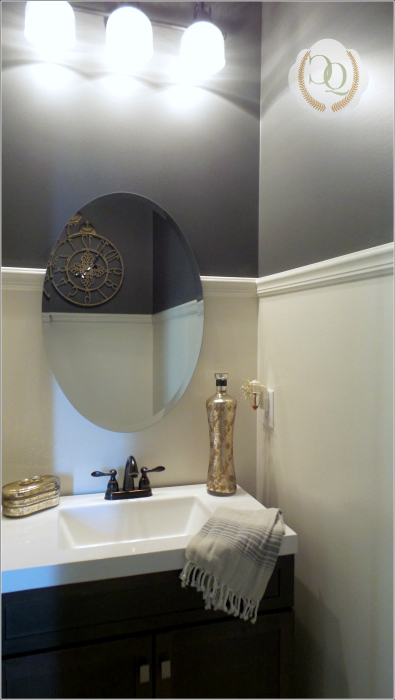 I am so glad we went with a dark, bold color for this small room...it added a much needed punch to this bathroom. I like using dark colors for small rooms. Thank you again sweet friend...love and hugs to you! Oooh...you really did add pizzazz to this little half-bath! Love the new color!! Great job! Love dark paint in a room....it's bold and so you...it shows your vibrant personality! How does the hubster feel about it! Thank you so much! I love the color and the drama it adds to this tiny space....it was just so "vanilla" and definitely needed perking up! The hubster loves it and said those magical words..."you were right"! :-) Every woman loves to hear that from a man! ;-) Hugs!! Love it! We have a dark blue / light blue bathroom. I love how the light color and dark colors make the bathroom look. We have a nautical theme going in that bathroom. Your idea looks great, well done! Thank you so much Carla! I love the light/dark contrast also…it added some much needed drama and oomph in this little bathroom. I love nautical themes in rooms. My brother and sister-in-law are remodeling a lake house and one of their sons is going with a nautical theme in his room…LOVE it! Sent you a little note about Jared. Thank you again so much! Love and hugs to you! So pretty, Benita. You must wear a big smile every time you enter the room. That "After" is pizzzzzzzazzzzzzy!!!! ,-) What a difference! Thank you so much! We love the color and the huge difference it made in this bathroom! Love and hugs to you sweet friend!! What a difference! Great job and I love the colors too! Thank you so much! We love it also and are glad we decided to go with the darker color! A total wow Benita! Moody and dramatic perfection. I love the Peppercorn. Thank you so much Vera! We are really pleased with this color and how this little bathroom looks. It is always amazing to me how paint totally changes the look of everything! Hugs!! Awesome Benita! Half baths (or as us old timers like to say, 'powder rooms'), are a fabulous space to go all out. Your space is sophisticated and elegant and so 'you'. Awww, thank you so much Doreen! I couldn't get over what a difference that paint color made...it just added some much needed "oomph" to this little space. 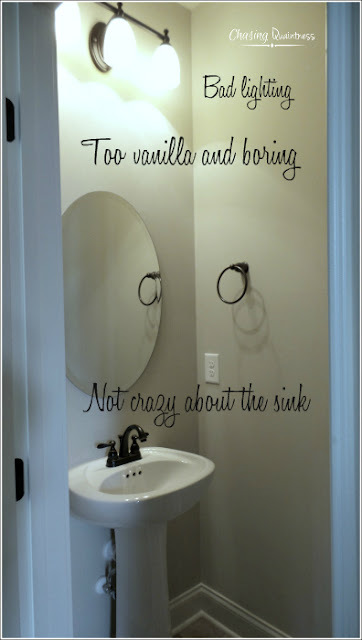 I think powder rooms ;-) are a great place to go bold sometimes! Now I have bust a move in my head... I love the dark color on the wall! Gorgeous! LOL…I don’t like to be alone on these things. It’s been stuck in my head for over a week now…LOL Thank you so much! I love the Peppercorn color. Love that you went with the Peppercorn. It looks fabulous! Thank you so much! I'm glad we chose the dark color. 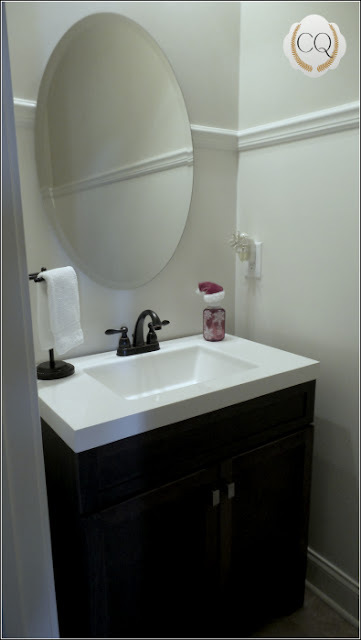 It truly made a huge difference in this little bathroom! Music is a wonderful motivator when you have a job to do, at least it is for me. Sort of like the "spoonful of sugar" helping the medicine go down...LOL Thank you so much Jan! Have a great one! Gorgeous! Color does make a difference doesn't it? Love it! Thank you so much! And yes, a little bit of color and some molding make a huge difference. I hated this little bathroom, now I just love it! Amazing difference! It's looking great. Thank you so much! 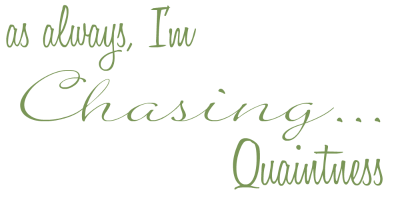 LOL…I love this song and the little dance moves it gives you on Wii…LOL Love and hugs to you!! Great job! The vanity is so pretty and it makes the mirror look so beautiful! I was admiring the mirror in the after pic when I realized it was the same mirror! Amazing what a little paint can do. Thank you so much Lisa! It is amazing what a difference paint can make. I had been looking for a different mirror, found one that I loved, but it was too large for the space. When we rehung the original mirror, it looked totally different! :-) Hugs! I hope you're okay after the big storm. I heard it was a nightmare down there. Yes ma’am. We got about 8 inches of snow, which is a really big deal here in the South. It was beautiful and I loved it. Nightmare is definitely what it turns into because Southerners never seem to be prepared. And, we usually get a lot of ice before the snow, which makes the roads treacherous. Love and hugs to you sweet friend!! Looks beautiful. Love the color. Did you get hit by the snow storm. The storm missed us here in southern Indiana. Thank goodness! Hugs!! Thank you so much! And yes, we did. Eight inches of snow on the ground for the South is a pretty big deal. It shut Nashville down...LOL...but then again, an inch of snow on the ground shuts the South down. Glad you guys dodged this bullet but I'm quite sure there are several more to come. Winter has a lot of time left! Hugs! !